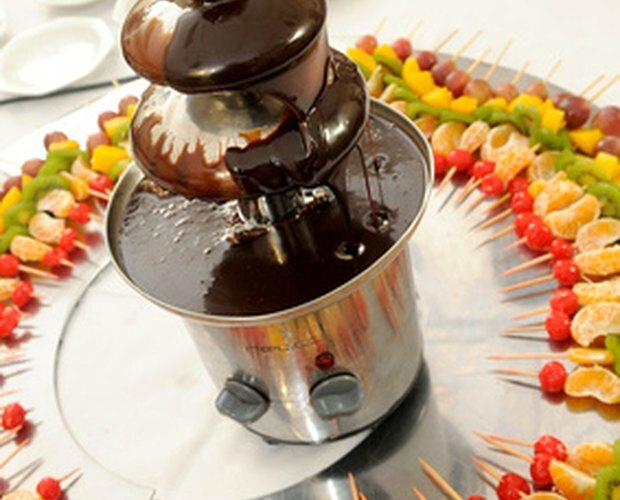 Chocolate fountains can be an elegant and delicious focal point for a party buffet. The cascading fountain of chocolate fills the air with an enticing aroma, and guests can enjoy dipping fresh strawberries, bananas, pineapple, marshmallows, pound cake or even rice cereal treats in the warm melted chocolate. You can use almost any high quality chocolate in a chocolate fountain. 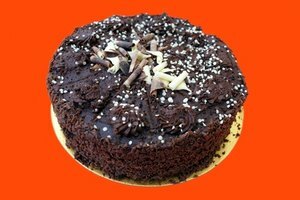 Adding vegetable oil to the chocolate will keep it at a consistency that will flow smoothly through the fountain. Plug in and preheat your chocolate fountain. If your fountain has a temperature adjustment, set the temperature to 100 Fahrenheit degrees. This will ensure that your chocolate will stay warm and melted once you transfer it to the fountain. Measure the chocolate into a large, microwave safe bowl. Consult the directions for your fountain to determine how many pounds of chocolate you will need to fill your particular fountain. Add 1/2 cup vegetable oil for every 5 lbs. of chocolate. Stir to mix the chocolate pieces and the oil. 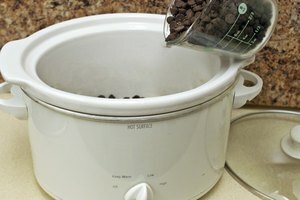 Place the bowl of chocolate in the microwave and heat it for three minutes on medium power. Using oven mitts, remove the hot bowl from the microwave and stir the chocolate with a spatula. Return the bowl to the microwave and microwave for one minute. Remove the bowl and stir again. Continue to microwave the chocolate for 30 seconds at a time, stirring between intervals, until all the chocolate is melted and combined smoothly with the oil. 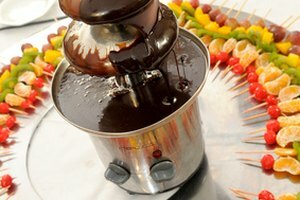 Fill the bottom tray of your chocolate fountain with half the melted chocolate and oil mixture. Turn on the auger to draw the chocolate up toward the top of the fountain. As the bottom tray begins to empty, add the rest of the chocolate. Instead of unflavored vegetable oil, you can use coconut oil, or special chocolate flavoring oils sold at gourmet cooking stores.